Paradoxically, it’s exactly this anachronism that makes Shinkai’s film relevant to this day. Voices of a Distant Star tells the heartbreaking story of two (literally) star-crossed lovers who communicate through text messages across ever-growing distances, as the girl Mikako joins the army and goes to space to fight aliens while the boy Noboru remains on Earth. 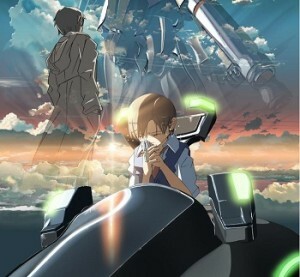 The film received wide acclaim for the beautiful way that Shinkai visualized it, especially considering the fact that he did it all at home, on his own computer. When I lecture about anime history in front of animation students, I always conclude the lecture with a screening of Voices of a Distant Star, and I always get asked if I’m sure that a single guy did it all, with equipment that’s far inferior to anything available for them today. I really think Shinkai’s film should be required viewing for anyone who studies animation – its production context makes it such a great motivational piece. But Shinkai’s film was hardly the first anime production made independently, or the first such production to win critical acclaim among anime fandom. Two decades prior to the release of Voices of a Distant Star, a group of fans made history twice when they independently produced two short animated films screened at the opening of the third and fourth Daicon science fiction conventions of 1981 and 1983. Beyond being an artistic achievement, these two films were a declaration of a generation of young people – a generation that grew up watching anime, whose world of images is dominated by giant monsters, giant robots, giant spaceships and girls in skimpy outfits, and they like it fine this way. The people who made the Daicon opening films went on to form the acclaimed studio GAINAX, popularized the term “Otaku” as a nickname for the anime obsessed, and the rest is history – a history that Shinkai himself grew into. Shinkai, a former animator in Japan’s video-game industry, saw how the next otaku (or perhaps post-otaku) generation takes this world of images much further than what the future GAINAX animators dared to imagine. The otaku culture comes under constant criticism for keeping people out of touch with reality and their surroundings, and above all other people. There’s nothing like the promise of virtual worlds and digital-mediated communication to help one sink into a world of fantasies (and even the primitive cell-phones of the early 21st-century era were a big craze among Japanese youth at the time Shinkai made his film). In this respect, Voices of a Distant Star can be seen as a successor to the DAICON: it is also a film born out of the otaku culture – but one that examines it with a healthy dose of skepticism. Sure, it’s got cool robots and epic space battles – but is all that excitement worth being away from your loved ones? And sure, technology is advanced enough to help us communicate through great distances – but is it really a substitute for meeting and talking to people face-to-face? Judging by Voices of a Distant Star and Shinkai’s subsequent works, he doesn’t think so. 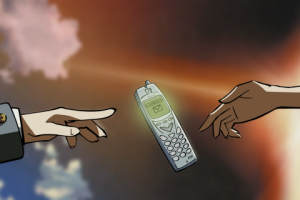 It is for this reason that Shinkai’s film remains so relevant, not despite but because cellular technology has advanced so far beyond the levels seen in the future he imagined: its warning about the harm of staying out of touch is every bit as true today as it was when Voices of a Distant Star debuted. Anime Ltd. is releasing Voices of a Distant Star on both DVD and Blu-ray.